One purpose of a trip to Russia was visited tourist attractions in the city of Moscow. This is one of two major cities are the main attraction of foreign tourists travel to the State when the white bear.That’s because there are more than ten Mokswa main place that must be visited. Been to Moscow actually do not have to enjoy the tourist attractions, but also look at how the development of a society are changing. To some extent, Russia is undergoing a transition to the desired direction. By observing the development of the local community, you will gain a lot of knowledge, not just fun. If travelers are enjoying Moscow by ship, would be able to see a large building with an elegant white crown golden dome from a distance. This building is called Khram Krista Spasitelya. This building is not just a plain cathedral, but it is a symbol of victory against Napoleon Bonaparte. 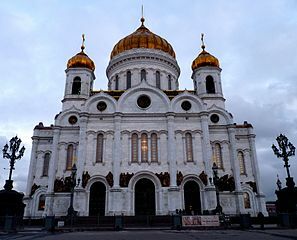 White cathedral that its beauty during his visit to Moscow today is a cathedral that was built in the time of President Boris Yelsin. The shape and size is exactly the cathedral which was built as a symbol of victory over Napoleon that was broken down in the communist heyday. To get to the White Cathedral, you can use the metro station and exit at Kropotinskaya. Perhaps this could be the most exciting experience of those who have never entered into the well. How not to enjoy the metro in Moscow as entry into the bowels of the earth more than 40 meters depth. When entering the metro station, you can use the escalator and at the same time quietly amazed at the little man down there.Once you arrive, you might ask whether this building will not collapse? Turns metro station in Moscow is not just any station. Metro is often referred to as the Best Underground Museum. In all the train stops, the tourists are offered a variety of ornaments and sculptures made by the artist’s hand in the communist heyday.All shades of struggle, whether it is played by soldiers and farmers. In every corner of the symbol would seem obvious that the communist sickle and hammer. Historically, a metro station during the cold war is the generals office. This place is ready for nuclear button is pressed. Here the refuge of the World War, all the people can hide safely. From this stored food reserves. In this place, everyone can travel to all corners of Moscow. Precisely because of the important role of this underground passage, the best Russian artists were invited to decorate the hall with a variety of their works.